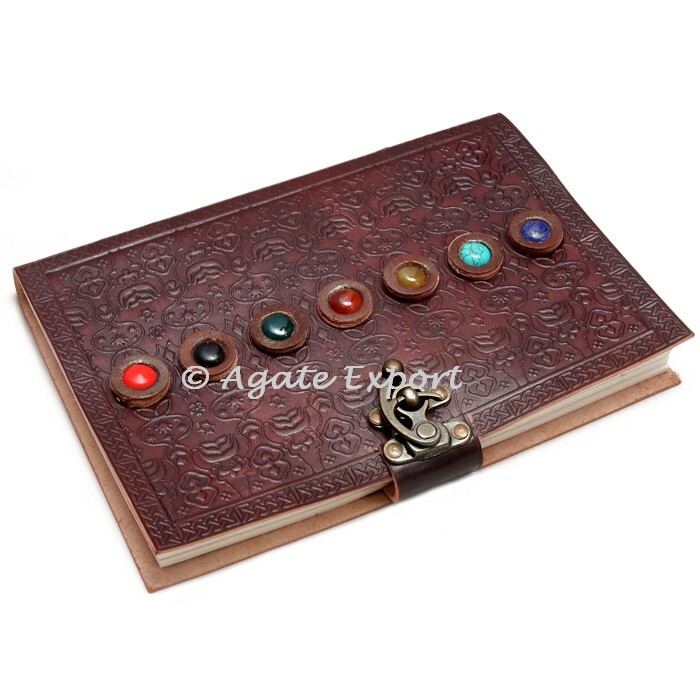 Chakra Stone Leather Journals has delightful leather secured diary highlights seven shaded charka stones sewn into the leather spread. It is an exceptionally interesting and otherworldly leather diary that any genuine essayist must have.Seven chakra leather journal has one vintage style bronze C-Lock to keep your scratch pad protected and organizeable.This Leather journal is produced using high caliber costly leather; it is stylish, Cool and upset looking.It has perfect size of 5 by 7 Inches and easy to carry in your bag.It has Numbers of plain sheets plenty to write down any notes, every day plans, unpleasant sketch or thoughts for your book, novel or projectile diary. Shop Online at Agate Export.